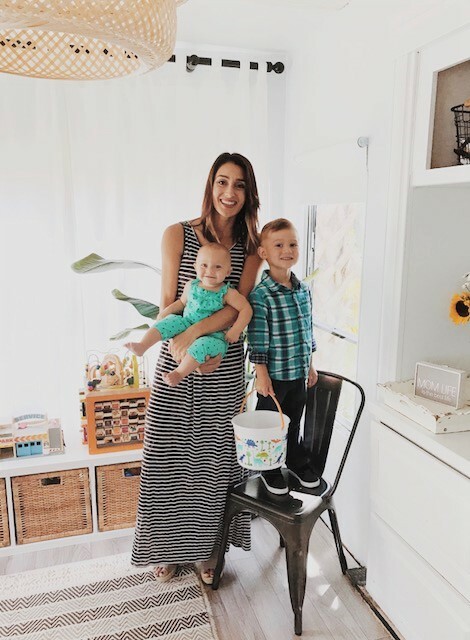 Full-time wife/stay at home Mom of two cuties and an amazing hubby, entrepreneur (I own my own wedding & event planning business) and aspiring interior designer. To live a debt free life style, buy land and build our dream home, to fulfill Gods purpose for our life and to be able to bless others while being happier with less. We met when we were eleven and twelve. Our moms were best friends. WHAT LED THE TWO OF YOU TO DOWNSIZE FROM YOUR 1,300 SQ FT HOME TO A LESS THAN 400 SQ FT RV? The biggest reason was that we felt we were living to just pay bills. We wanted to get 100% debt-free, save money and have financial freedom. We actually made the decision 3 years ago. We purchased our RV and started renovating. My husband had to move for his job so we put the RV dream on hold and rented it out to a friend of a friend for a year. We moved away and rented for 2 more years. We almost sold our RV, but for some reason it didn't work out. At that point our intentions to move into the RV were long gone. It wasn’t until before the summer of 2017 when I was pregnant and had a heart to heart with Paul one night. We were tired of working just to pay bills. The same place we were when we purchased our RV. We started talking options to getting debt free etc. One of our best friends out of no-where called and told us if we wanted to park our RV on their property we could. After talking it over and praying about it together we decided selling everything and downsizing would be the best option for our family. I spent 4 months selling everything we owned and haven’t looked back! WHAT CHANGES HAS YOUR FAMILY HAD TO MAKE TO BECOME DEBT-FREE? We had to downsize and sell all of our furniture and a lot of our things. Instead of blowing our tax return we used it to pay off debt and put money in our savings. We sit down together every week, set a budget and communicate with each other before we spend money on anything or go shopping. If one of us NEEDS something we talk about it first and plan it out instead of walking in blindly and buying whatever we want like we use to. Keeping each other accountable and being honest with one another is KEY. We also only eat out 1x a week and 2x max (but rarely). We cook every meal which I love doing more anyways. You get more for your money and its way healthier. We also started doing capsule wardrobes for the entire family so we buy less clothes and create several outfits from a few items... it’s awesome!!! YOU’VE MENTIONED ON INSTAGRAM HOW YOU KNOW THAT LIVING IN AN RV IS NOT FOR EVERYONE BUT THAT YOU AND YOUR HUSBAND HAVE A PEACE ABOUT IT. CAN YOU DESCRIBE THAT PEACE TO US? There are a few reasons that living full-time in our RV brings us so much peace and joy; having less to maintain means more time to spend with family and activities. Also, being able to be creative and try new things with the space has been really fun for us. Lastly, knowing that this is a huge opportunity to reach our debt free goal at a faster pace is relieving. WHAT ADVICE WOULD YOU GIVE TO COUPLES AND/OR FAMILIES ON A SIMILAR PATH OF DOWNSIZING/BECOMING DEBT-FREE? A few things I would say: Be intentional, have a game plan, set goals together and most importantly have fun while doing it! AFTER ALL OF YOUR DE-CLUTTERING, DO YOU HAVE ANY RULES FOR WHAT COMES INTO YOUR HOME? Haha... OH YES!!! Our new rule is we don’t keep anything unless we “love” it. We don’t bring anything into the house that isn’t serving a purpose or being used on a regular daily basis. I LOVE HOW LIGHT AND AIRY THE RV IS LOOKING…WHERE HAS YOUR DESIGN INSPIRATION COME FROM FOR THE DESIGNING AND RENOVATING OF YOUR HOME? I love Instagram and Pinterest when looking for inspiration. I’ve spent months dreaming of this space and doing a ton of research. When looking online and creating inspiration boards I only saved ideas and spaces I could imagine our family living in. The rest just came naturally to me. HOW DO YOU ENVISION LIVING IN YOUR HOME ONCE THE RENOVATIONS ARE COMPLETE? HOW DO YOU WANT TO USE THIS SPACE? We envision using this space as a cozy retreat for our family while achieving our goal of getting debt free. We would also love to host friends more, have small life groups and inspire others. DO YOU HAVE A VERSE, MANTRA, OR WORD THAT HAS GUIDED YOU THROUGHOUT THIS JOURNEY? *Paul and Crystal are finishing the process of designing their new home. Stay tuned for updated photos!